While I will miss the warm weather of summer, there isn&apos;t a better season especially in Hendricks County than the fall. The cool air becomes a little brisker, the changing leaves begin to decorate the countryside and the county&apos;s festival season kicks up a notch. Our Hendricks County Insider team has already begun to get you ready for one of the best times to visit this area as Eric Ivie provided his list of Top 10 Can&apos;t Miss Fall Festivals earlier this week. But that&apos;s just the beginning. We have a whole host of stories in the coming days and weeks that will set the stage for this glorious season as well as an entire page on our website dedicated to providing details and activities for every one of our upcoming fall weekends. Consider this a sneak peek of what&apos;s to come and why you really should consider experiencing Hendricks County this fall, especially as a more affordable option for fall break plans. Any Hendricks County list of fall, family fun has to begin with a trip to Beasley&apos;s Orchard in Danville. If you never been to this fall institution before, this year is the perfect time as Debbie Beasley and her family have more planned than usual this year. Yes, they will still have their market filled with local goodies including their fresh-picked apples in a Civil War-era barn. And yes, they will still have hay wagon rides out to their u-pick pumpkin patch and their annual corn maze, which will celebrate the 50th anniversary of the Ford Mustang this year. 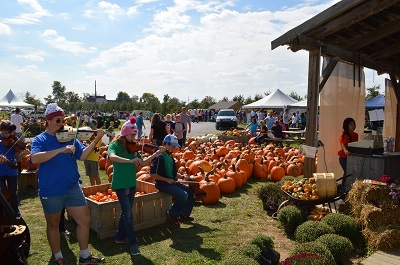 The Heartland Apple Festival will also remain in its usual spot during the first two weekends of October. But fresh out of college, son Calvin Beasley is back and ready to make his mark on the family business as he finishes up construction on handmade carnival-like, sports-themed booths and a giant inflatable pillow that the kids will love and that will make a visit to Beasley&apos;s even more memorable. But while any Hendricks County conversation about fall may begin with Beasley&apos;s, it certainly doesn&apos;t end there. Other fall destinations that I would highly recommend and that our team will talk about quite extensively over the coming months include Natural Valley Ranch in Brownsburg, McCloud Nature Park near North Salem and the Rural Routes to Main Street Cultural Trail, a self-guided driving tour through Hendricks and Morgan counties. We also plan to provide plenty of information about our popular fall activities, hike and bike opportunities and other fall traditions and happenings. We realize our visitors also need a place to stay and recommendations for the best local places to eat, so we will continue to provide that kind of information as well. So, while the leaves may change over the coming weeks, the type of insider information you need to make your fall weekend planning easier will not. We hope to see you here in Hendricks County this fall!